New Item! These chewy peanut cakes are popular in asia and in Hawaii. They are great on the go as they come packaged in individual wrapped pieces. For a more crunchy option, we also have the crunchy peanut cakes. 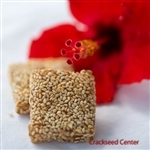 Ingredients: Peanut, White Sesame, Sugar, Maltose, Rice Flour.